Our alarm went off at 5:45 am. We quickly dressed and grab our pre-packed bags. We were off to Machu Picchu this morning. We dropped our bags at the reception desk for the day and they handed us our packed breakfast in a brown paper bag. The weather in Peru is all over the place. Sometimes it’s cold and rainy and sometimes in sunny and hot. This morning it was cold, about 40 degrees Fahrenheit, with a cold drizzle. The sun was barely peeking through the clouds. We bundled up and got in line for the bus. To get to Machu Picchu from Aguas Calientes, there is a bus that climbs the mountain. All in the all, it takes about 15 minutes to get to the top of the mountain. The line for the bus was already long, lined up about two blocks on a very steep hill. We grabbed our place in line and ate our bagged breakfasts. We realized after about 30 minutes that the rain wasn’t going to dissipate and bought ponchos from a local woman selling them for about $1.50 each. We secretly thought that if we bought the ponchos it might stop raining (and it did when we got to the top). 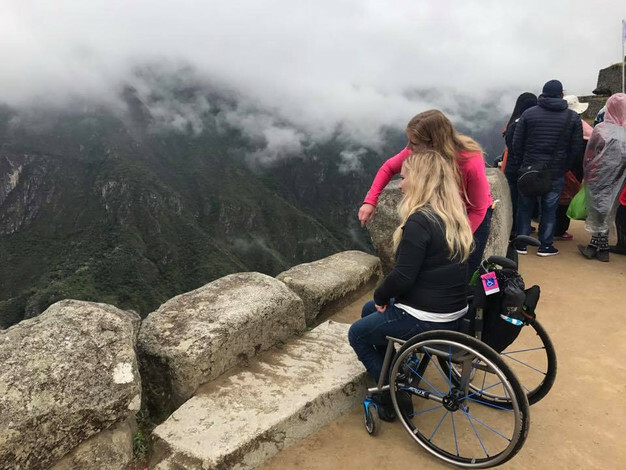 We knew that Machu Picchu would be a challenge with my wheelchair, and I prepared myself before going that I might not be able to see much of it. As we approached the entrance, a staff member asked us to follow him. He gave us a map of the historic site and instructed us where we were able to go with the wheelchair (it wasn’t very far). Another staff member started to push me and soon we reached the stopping point for me, about 100 feet into the site. Tony, Julie, and I looked to the left and to the right. One direction had a flight of stairs going up and the other direction had a flight going down. Mind you, the flights of stairs were rocks that had been stacked hundreds and hundreds of years ago, so not the most sturdy looking pathways. We picked the right and I climbed onto Julie’s back. About two dozen flights later we reached a flat surface, one of the terraces where the Incans used to grow their food. We stood (I sat) here for a while and absorbed the vast scenery in front of us. I was thrilled that I made it this far and could have been content just resting there for the morning. But Julie and Tony had other plans for me. I found myself being bounced down a flight of stairs made from rocks the size of basketballs. This time, though, a staff member was helping. He directed us to an area that was flatter and would be more accessible, and advised us to let him know when we were leaving. 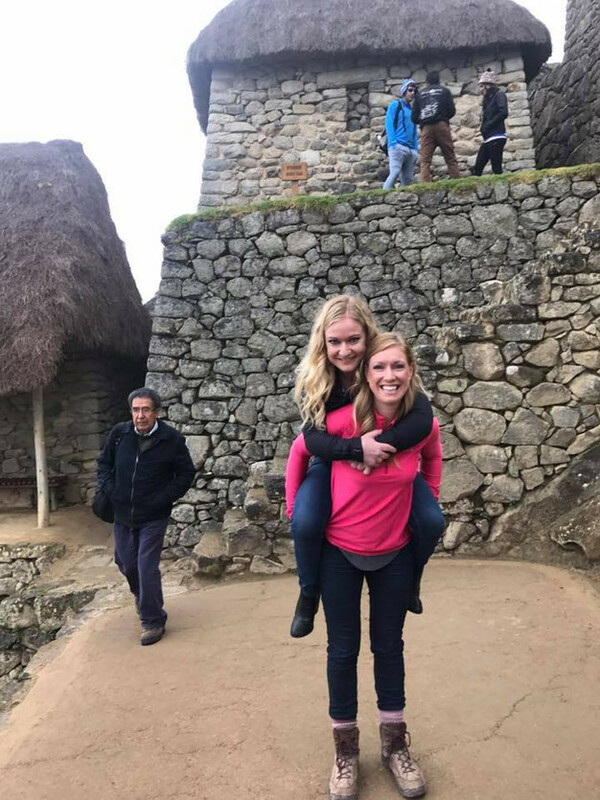 I was amazed at the extreme helpfulness of the staff at Machu Picchu. 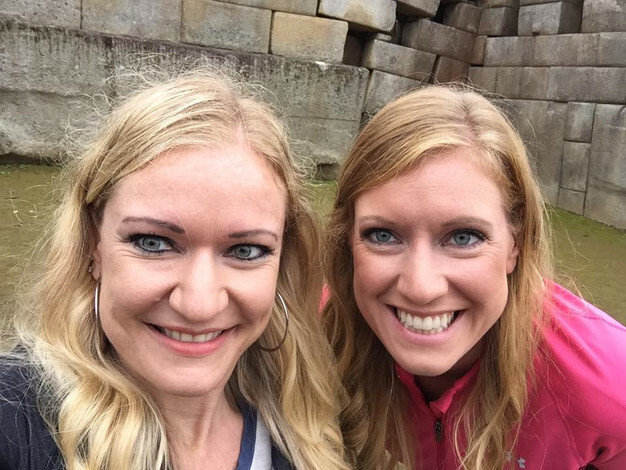 Rather than telling me that I couldn’t do Machu Picchu, they helped me find areas that I could see and experience. The staff was spread throughout the site, and communicated via handheld radios. At one point, Julie and I were waiting on the bottom of a flight of stairs while Tony checked out what was at the top. He came back and told us that the entire staff was on alert for us. “The two blondes are heading towards the three windows,” they communicated to each other in Spanish (translated by Tony). There are about 2,500 people at Machu Picchu at any given time, and there they were on alert for us. You would have thought we were Michael Jackson and his entourage. As I approached Machu Picchu that day, I wasn’t sure what to expect. Many had told me it would be extremely spiritual and I’d come away with some profound thoughts, finding an entirely new purpose in life. Many told me that I’d find an awe in a culture of people that we know so little about. As I left that day, I did have some profound thoughts. It was amazing to me that an entire tribe of people settled there on those handful of mountains. That they never saw flat land. It was cold there all the time (it got to about 60 degrees Fahrenheit that day), most days the clouds hiding the tops of the mountains. I wondered if the Incans had the same emotions as people today. Did they love the same? Did they hate the same? As I left that day, the clouds finally clearing way so we could see the top of the mountains, I couldn’t help but think of the dozens of men working that day, who chose to let me see that part of the world, instead of telling me no, and keeping such a treasure from me. I knew then that the Incans did in fact have the same emotions as we do today. They were human. We all are. We’re all in this together, just trying to get through. So as I finish this part of the story, I must thank the men that encouraged and helped me that day. I have to thank Julie who carried me up dozens of flights of stairs, slipping and sliding on the wet rocks, commenting that her knees just weren’t strong enough for this. And thank you to Tony who helped balance Julie when she had too much weight to balance, and for carrying my wheelchair up the same dozens of stairs. After we arrived back in Aguas Calientes, taking the same bus down that we took up, we found lunch. Towards the end of lunch, we asked for our check and I said, “American Express?” asking if they would take AmEx for a payment method. The woman nodded her head and walked away. I laid my credit card on the table in front of me waiting for her to return. When she did, she set a coffee in front of me. We all looked at her confused and she said, “Americano Expresso, no?” Language barriers are funny at times. We had just a few hours until our train departed Aguas Calientes back to Cusco, and so we headed to the local markets. The markets were very similar to markets found in other countries, full of knick knacks and souvenirs. I noticed very early on though that the owners of the shops were not pushy. They would ask once if we were interested, and when we told them no, they immediately backed down. This was extremely refreshing compared to most other cultures and I just loved the respect. My favorite part of that afternoon was when a little boy approached me at the markets. My Spanish (which I have been learning for about a year and a half) was just strong enough to have a fluent conversation with him. I learned that he was six, his mother was working one of the shops, he did not have a girlfriend, and he lived in the mountain very far away. His name was Enrique and he had a runny nose (I wanted so badly to hand him a Kleenex). He was in awe with my wheelchair and had a hard time understanding what it was. How different his life was than mine, and likely would be different for the rest of his life. He is one of those people that I encounter on my trips and will never forget. The afternoon passed quickly and before we knew it we were boarding our train back. We had a table for four and the three of us sat next to a very nice Columbian man. We had dinner on the train and the staff proceeded to entertain us with a traditional Peruvian dance followed by a fashion show. I thought it was so strange…a young woman and man modeling tops made of alpaca fur. It went on for about 30 minutes, both of them strutting up and down the isles, hoping to spark someone’s interest. We arrived at the train station in Cusco and our taxi driver (one we had taken ownership of early on in our trip, who took us everywhere) was holding a sign with our name on it. The drive was about 10 minutes from the train station into the Cusco city center, where we would be for the next two nights. We got further into the city when he suddenly stopped and starting backing into a street. He proceeded to go backwards down a one way street, completely downhill, for about a mile and a half. The street didn’t appear to be for cars and was crowded with young adults partying at the local bars. It was about 10 pm, but he didn’t care. Everyone cleared the way, and at the bottom of the street our hostel was waiting. It was cold, and not just cold in temperature, cold in the way it felt. The walls were cement and the bathroom small and off to the side. The walls were a purplish-pink shade. On one side, there was an old wooden door, about three feet tall, with an old clasp holding it shut. We joked that there were bodies in it…and that one of us should find out (we were all too scared and never did find out). There were two single beds on one wall and another ‘matrimonial’ bed on the other. A ‘matrimonial’ bed is a bed in Latin America used for married couples. It’s somewhere between the size of a twin and a double. King beds do not exist in most of Latin America. Tony and I set our bags down and crawled into the matrimonial bed. The sheets were a faded dark shade of purple and appeared to have been washed at least a hundred times. The comforters on the bed (there were two) were a shade of yellow and white. I’m still not sure what color they were ‘supposed’ to be, but nonetheless, I was determined to do this budget travel thing, so I gritted my teeth and crawled right in. Julie quickly did the same thing. Tony turned off the lights and we both screamed. “We can’t do this. It’s so scary. We think it’s haunted.” We chimed. “I felt a cold hand run down my back,” Julie said. And before I could even respond, she was on her feet pushing her single bed up against ours. 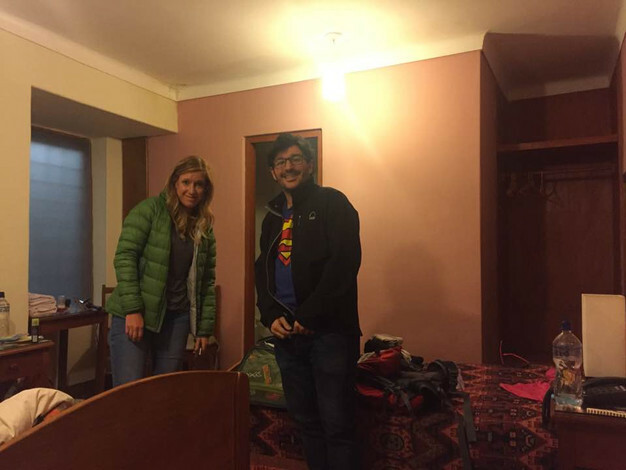 We spent the next two nights with our beds pushed tightly together, scaring away any ghosts that might have lived in the room that was hundreds of years old.